This is a special one night introduction to scuba diving. 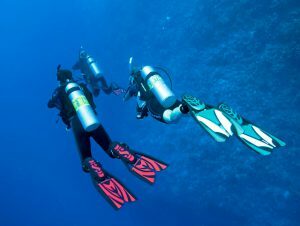 We bring scuba gear to the pool and invite you to jump in and try out the sport in a safe, controlled environment. Come with your friends and try something new! All equipment is included. These splash parties make get-together for your friends and family! We’re famous for great service, attention to detail and most of all underwater fun. We can’t wait to help you train and learn this amazing hobby! It’s seriously one of the best! We may be a little biased on that, but we love what we do and love to let others experience the mysteries of the waters. Do you have more questions about this class? Feel free to give us a call or email us.